Dodhia Brass Moulding Works is manufacturers and exporters of brass products. We are manufacturing and exporting brass products since 1963. 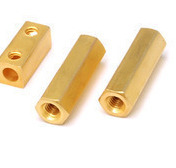 We are manufacturers of Brass fasteners, brass inserts, brass cable glands, brass sanitary fittings, brass ppr mouldings, precision brass components, brass turned components, brass electrical accessories, brass components and brass sheet metal components etc.